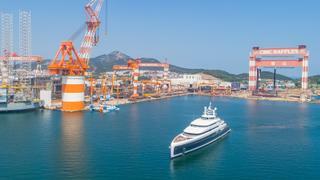 New photos have been released showing the delivery of Illusion Plus, the largest yacht ever to be built in Asia. The yacht has now departed the Chinese yard Pride Mega Yachts for her maiden voyage to the Monaco Yacht Show, where she will be presented later this month. 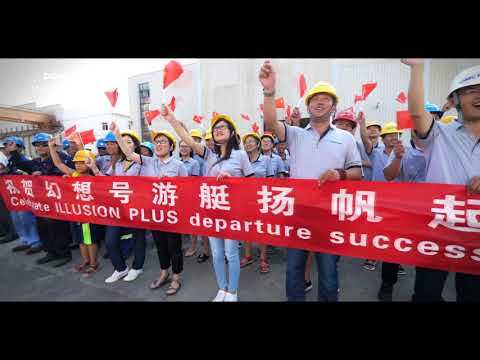 She left the yard amongst a colourful send off from the yard, which even featured a traditional Chinese dragon. Her exterior lines by British studio Rainsford Saunders Design were inspired by Rolls-Royce motor cars, with a vertical bow and gently sloping transom. Built from a steel hull and aluminium superstructure to ABS standards, the project dates back to 2007 and was put on hold when the global financial crisis hit. 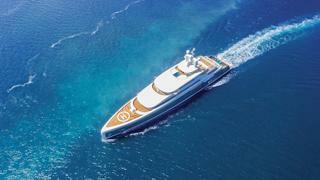 The six-deck yacht was listed for sale in February with Y.CO with an asking price of $145,000,000. A spacious interior by Sinot Exclusive Yacht Design, and installed by Greenline Yacht Interiors of Dubai, will accommodate 12 guests in eight cabins. This comprises an owner's suite, two VIP suites, two doubles, one twin and two double cabins that convert to lounges. All guest cabins will have television screens and en suite bathroom facilities while a further 15 cabins will sleep a maximum of 25 crewmembers. The main deck saloon will have a mezzanine feature that allows the interior to be opened up creating a double-height atrium, comfortable seating and a cinema screen while an elevator will connect four of the six decks. Other key features include four guest lounges and two interior dining areas, a dedicated spa with a sauna, steam room and massage room and a vast tender garage. There will also be a lower deck ocean lounge with a bar. 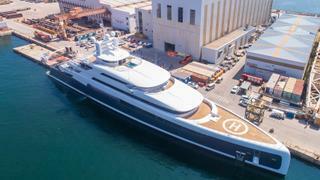 Illusion Plus is also kitted out with her own helicopter landing pad. Outdoor spaces are extensive and include two Jacuzzi tubs, one with a waterfall feature. Power comes from two 3,000hp Rolls Royce diesel-electric engines for a top speed of 17 knots. She has a range of 5,000 nautical miles at 15 knots. For added comfort and safety, she has also been fitted with Rolls Royce retractable fin stabilisers.